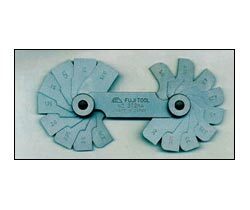 Being a Supplier, Exporter and Importer, our company has earned accolades in offering Radius Gauge (272) to the customers. Offered range is used in several industries for measuring the radius of any kind of surface. This product is offered by professionals is accredited by esteemed customers for excellent attributes such as anti-corrosive nature, less maintenance and long functional life. It is manufactured from qualitative range of raw material, which is quality checked by team of experienced professionals.